Matt, There use to be a Hamms beer. Could that be what it is? 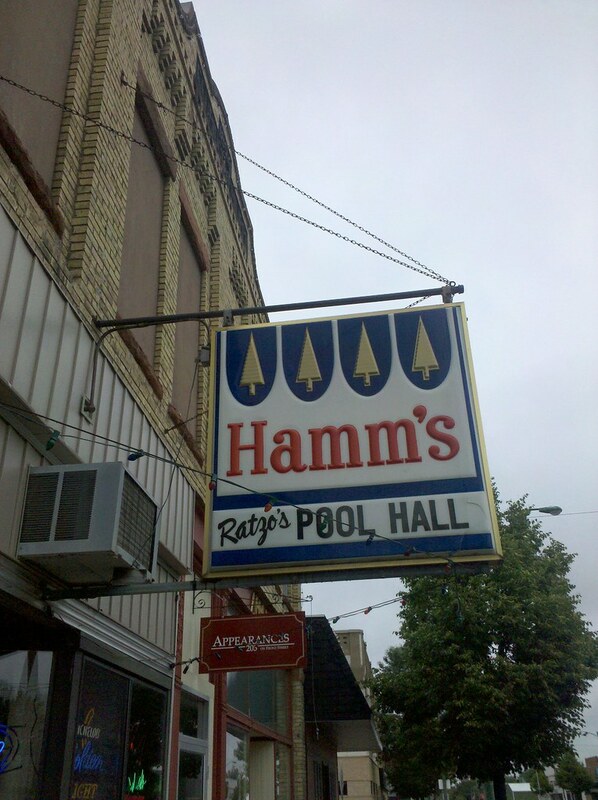 Ratzo’s pool Hall with Hamms beer????? Didn’t know that they still made it. There was a Hamm’s bear on the commericals. It was the land of sky blue waters. This was waaay before your time. I use to see the commerical when I lived in Chicago. Hamm’s beer….taste like Pork?? I am actually enjoying a MGD 64 light right now. 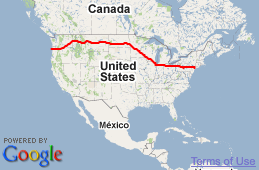 I invite matt over but he is like 1500 miles away. Hmm is Matt pool sharking tonight ….Actually I am glad he found a real town for now…so many grassy plains….lately…Maybe a nice place to stay tonight…Hot tub, pool, shower….Meal and strawberries too. Karen Too……he will probably walking into North Dakota tomorrow…about 20 miles or less out as of the last photo…Hamm’s Pool hall ratzo ria…….Peace and seeyou on the trails…. Thanks, Jeff. Had a massive storm here Saturday night (for about five hours), so my connection was affected. Back to normal today. ps…lots of Hamm’s beer stuff on web…logo was script not printed….but I vote for the hamm’s beer and pool hall…of Barb C.
Hamm’s was a local MN beer that has since been purchased by Miller. Use the link above to view some memorabilia. I am old enough to just barely remember the Hamm’s Beer Bear commercials. Yeah that’s an old Hamm’s logo. You can find it on some of the older cans. Who doesn’t love a good pub and draft beer after a long day?? Cheers Matt!! My dad drove truck for Hamm’s beer on his days off of the Firestation… we grew up with cases of Hamm’s beer (bottles of course) lining the basement walls. Very cool sign… take care Matt. “From the Land of Sky Blue Waters….” should be the caption. Fun! I remember the bear / beer commercial from when I was young. Bear use to hang out on the river with his beer in hand…..That was about 1964, for me…. Wow forgot about it until now. Thank you Matt Man !!! Hamm’s beer commercials featuring the bears and other woodland creatures were very popular in the 1950s. We had church in the evening in my little home town and we kids always wanted to hurry home wo we wouldn’t miss the Hamm’s beer commercials — much to the chagrin of our tea-totaling Methodist minister. I don’t know about the beer but the commercials were very popular. The overall effect of the chorus singing these lyrics combined with the video was rather foresty and soothing, although at age 8 or so I couldn’t sample the product to see if the advertising was true! I want to stop here dang it. Just one cold one please. Let me out of this computer I want a Hamms. Have you seen what’s ahead? This may be my last chance for days. I remember a Hamm’s jingle that went something like “A beer is a beer is a beer is a beer, until you’ve tasted Hamm’s.” I also remember something about “Hamm’s – the beer you’ve been looking for” which was the inspiration for a lot of jokes when I was a youngster. Does anyone else ever worry that advertising creeps in and consumes mental capacity that could be put to better use? What do I not know because of these stupid beer jingles etched in my memory?